One of the most magnificent places I have ever visited is Yosemite National Park in California. Ancient glacier activity in this region of the High Sierra left behind enormous rock formations that created a natural cathedral unsurpassed by anything ever designed by human minds or hands. One of the early Europeans to explore the valley described it in these same terms. John Muir visited Yosemite several times in the 19th and early 20th centuries, spending several years there in spite of the fact that he had a wife and children in San Francisco. His appreciation for the beauty and wildness of Yosemite drove him to fight for its long-term preservation. Some battles he lost, but by and large, his petitions to government officials are responsible for the establishment of the national park there. Lately I have been reading Muir’s descriptions of the land forms, his detailed identification of the flora and fauna, and his natural history of Yosemite in selections from the e-book, The Collected Works of John Muir. I am amazed at how much ground he was able to cover and the extent to which he cataloged so many of the species in the area. Without the aid of modern equipment or the assistance of the infrastructure later installed for hikers, Muir explored parts of the valley and surrounding region that only the most experienced hikers and climbers would attempt today. He craved the wilderness almost like a lover. In the mountains and forests he found adventure, inspiration, stimulation, and peace. For those who have visited Yosemite and were left speechless by its wonders, I highly recommend John Muir’s works — he manages to articulate what I could not put into words when I first saw this marvelous spectacle. Before my wife, younger son, and I made our trip to Yellowstone this summer, we did like so many other families do before major trips and spent some time reading about the park, its unique features and characteristics, places of particular interest, and potential hazards to avoid. I even watched a few videos about Yellowstone, both professionally-produced and amateur. Of course, one of the major elements that brings millions to this park every year is the wildlife, and for most visitors, the principle of “the bigger the better” holds true. Most of us want to see a bear, at least from a safe distance, but they tend to stay away from the roadways — we were lucky enough to see a mother and her cub the last day we were there. The elk and moose are quite impressive in the size category too. We saw several elk but not a moose. 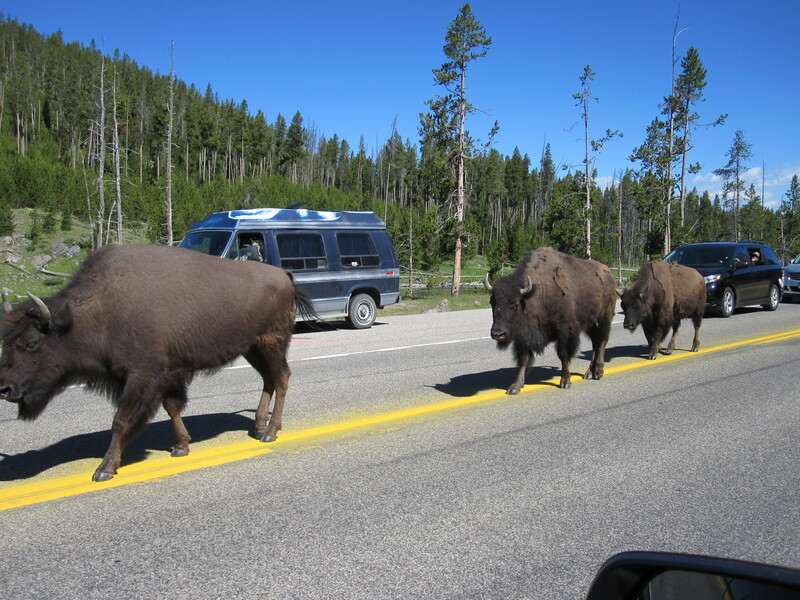 We knew that bison often made their way to the major roadways in the park and that traffic could be stopped for significant periods of time for herds of the animals to pass. What we didn’t expect was that sometimes the bison actually use the roads as a path, slowly ambling their way along the pavement, almost as if they are curious about the visitors and have arrived for an inspection. There are close to 5,000 bison in the park, so sightings of large herds are frequent. Professional and amateur photographers come out before daybreak to claim their favorite spots on small hills in the bison hotspots, such as Hayden Valley, to get the best shots of the beasts in their natural environment. However, as we discovered on our first day at Yellowstone, you can get a pretty good close-up photograph of a bison from the window of your car, as so many visitors have been doing for years. I took this one from my window as we waited for a group of the animals to clear the road. Notice that these hooved creatures are following the center yellow line, almost as if it were a trail marker. They were walking along slowly, seemingly with no fear or even regard for the nearby vehicles and their occupants. The dangerous assumption by some park visitors is that these are harmless animals, but as calm as they seem to be, they can become extremely aggressive and dangerous if approached or if they feel threatened. Park literature and signs are abundant warning people to stay a very safe distance from all wild animals in the park , especially bears and bison. Several visitors are seriously injured each year from foolish encounters with bison. As these massive animals passed our car, I was taken with how they brought everything to a standstill, commanding the right of way. They marched through like royalty participating in a parade — the trooping of the colors as it were. In many ways, the park is theirs, along with the other multitude of species that call Yellowstone home, as it should be. I wish people would always keep in mind that we are only visitors, and as such, we should be on our best behavior to ensure that places like Yellowstone are preserved and treasured.